Hello folks! I hope you’ve all had a great start to 2018! Mine has been (generally) a good one and I had a significant birthday as well, so it’s been a month of celebration. Thank you to all the old friends who shared my birthday, it was really lovely to re-connect with people from all the different periods of my life – school, work, Canada, film, TV… Magical. My episode of Kay Mellor’s GIRLFRIENDS aired (I’m in Episode 3 if you want to catch it on ITV Hub here). Nice scene with Miranda Richardson and Zoë Wannamaker. I’m really enjoying this series, what a great writer Kay Mellor is! Miranda Richardson, Zoë Wannamaker – and me! Right, I’m off to enjoy this last day of January, have fun and be kind! We’ve had the first dusting of snow on the Sheffield hills, my cards are sent, presents mostly bought, now I’m making lists for food shopping for the big day. I’ve also been busy on the business side, getting new actor headshot pics and making a new video to share with you, so lots to tell you about in this update…. I usually record a video each Christmas of me reading A VISIT FROM ST. NICHOLAS (‘Twas the night…). I used to read it to my children on Christmas eve in the pre-divorce days, but I never see them to read it now, so I started recording it for them. This year I decided to record an audio version for them and put a bit more into the production side, with sound effects and such. I’m very pleased with the results. I’ve put it on YouTube with some family photos and videos under the audio, here it is…. If you’d like the original audio version in it’s full glory, it’s here to listen or download…. or buy if you wish to send me money. I’m going to be in your house in January! Earlier this year I recorded a lovely episode of GIRLFRIENDS, Kay Mellor’s new drama for ITV. A couple of nice scenes with Miranda Richardson and Zoë Wanamaker. The series begins Weds January 3rd. I’m in Episode 3. It’s a lovely cast, please watch. And here’s a final Christmassy treat for you, the first Yorkshire Teabaggers video. Our parody take on one of the most popular of Christmas songs. What a lot of Christmas goodies eh? So, now I’ve unloaded my sack on you, I will bid you a Very Merry Christmas and the Happiest New Year. Stay warm, stay safe, help others, spread the love and be good to yourself. Hello folks! Quick update and some new pics…. Since the last update I had a great day on a new ITV drama, GIRLFRIENDS, written and directed by the lovely Kay Mellor. Had a lovely scene with Miranda Richardson and Zoë Wanamaker. Had a couple of meaty auditions for a lovely soap stint and a new musical tour, but no luck on either. Sad Dave. But keeping busy with Showreel updates, so if you’re an actor looking for a new reel, or want to refresh the one you have, give me a shout! Had a nice photo session yesterday with an up and coming photographer, Samantha Devine, and I’m including a few below. Click to full-size them…. I’m delighted to say my weight-loss routine is going well, I’ve lost over 50lbs since this time last year. Feeling great and buying new clothes to fit the new me. And finally, coming up, a BBC animated sitcom, STICKY, starring Tom Hardy. More on that when I get the details. You’ll have my voice and an animated version of me! On your telly for 2 more weeks! BROKEN on BBC1 is almost over, just one more episode next week, 4th July – and this is the main episode for the Kerrigan family. Look at that cast list! Bloody amazing group of people, all acted their hearts out for this lovely series. Everyone has fingers crossed for a second series. Last episode Tuesday July 4th. You haven’t seen the last of me! I will return in the Broken timeslot the following week for the first episode of IN THE DARK, starring MyAnna Buring. First episode is July 11th. Here’s the trailer….. I only have a short scene with MyAnna Buring in the early scenes of the episode, but it was lots of fun to do, as you will see. There’s more of me than there is today in the picture below – I’ve lost over 30 pounds since then – and feeling much better for it! Here’s the link to my blog from back then…. And yesterday I went to the Readthrough for a new series for ITV. I’ve one scene in one episode, but it’s a lovely scene with two AMAZING actors. More about that later, I can say nothing at the mo! That’s all folks! Keep watching your TV! Wow, what a couple of weeks we’ve had. Terror attacks, horrific fires. And May holding on to power by her finger tips. I was very pleased with the Labour result in the election last week. Yes, a straight win would have been better, but things may change in coming weeks as May collapses. The Grenfell disgrace may just be the thing that finishes her off, so roll on the Queens speech and subsequent parliamentary vote next week. I walked the streets delivering leaflets and knocking on doors for this election, and I have to say there was a great feeling of support for the Labour Party. When the time comes to go to the polls again, and it could be soon, I hope you’ll see we can actually win this thing, get out there and help turn the tide against austerity. Since the election, I’ve been kept busy on the latest production from WellRedFilms, a left-leaning, Sheffield-based group of filmmakers. The latest video, shot on Thursday evening, released Friday and online now, takes a topical look at the aftermath of the election and looks at various campaigns we still need to continue. I took the production lead on this one, working 5 cameras, edited it all together once I returned home, suffering technical issues and internet problems. I’m very pleased with the end result. I hope I can develop more work like this. In other news, BROKEN on BBC1 is getting great reviews and I return for the remaining episodes as Christopher Kerrigan, brother to Sean Bean. Not a huge role, but loved it. Jimmy McGovern has written a timely piece on British society, the cast is incredible. It’s not easy viewing, have a tissue handy, but you can’t stop watching. And I had some good news about an upcoming project. I can’t say more now, but it’s a nice role in a new series from another hugely respected writer. BROKEN. BBC 1. Starts May 23. 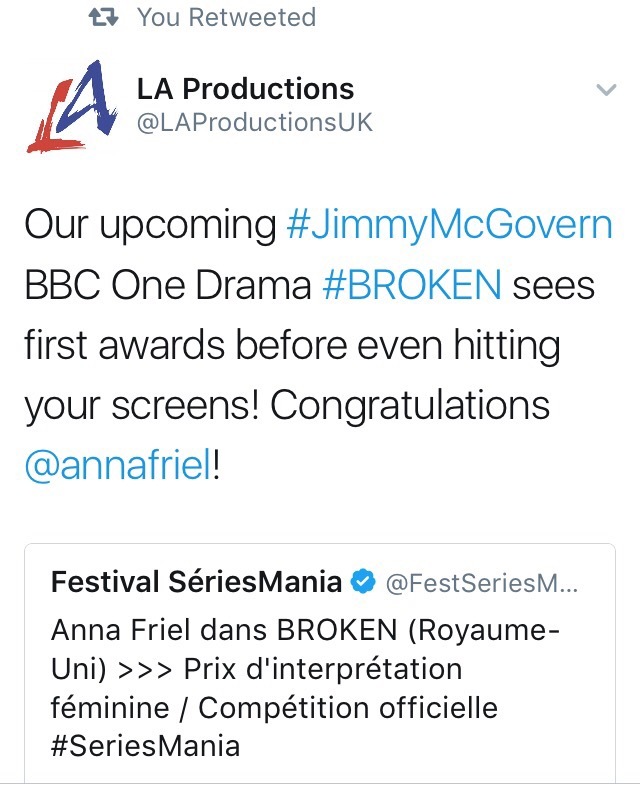 I know, I’ve been going on about BROKEN for months, but your chance to see it is very close. BBC has announced the 6-part series starts May 23rd. I’ve seen the first episode… I went to a screening in Liverpool on Monday, lovely to catch up with everyone. Working in Hollywood (Bowling Alley) with Sean Bean! I’m sure to nag about this again, so please forgive me, but I want everyone to see this series. An interview with Anna Friel in the Sunday supplements said the new Jimmy McGovern series, BROKEN, is coming to BBC 1 soon. I was delighted to see this tweet this afternoon that it’s already winning awards. I’m in 4 episodes, not a huge role, but I play Sean Bean’s brother, so it’s a great part. I’ll let you know more as details are released. A new year of acting and Teabagging! I trust Christmas was good to you and that 2017 has been a happy one for you so far. Look at this, almost Valentine’s Day and it’s my first update of the year… naughty Dave. My birthday was quickly followed by my son Benjamin reaching his 15th… He’s a pretty amazing young man and makes me very proud. Glad to say BBC is showing trailers for upcoming drama series and Jimmy McGovern’s BROKEN, starring Sean Bean (and me as one of his brothers), is in the list. As soon as I have dates I will post it here. In the meantime, The Yorkshire Teabaggers have been busy in the rehearsal studio with a few gigs recently and more to come. We made this video during our rehearsal this week, consider it our Valetine to the women of Yorkshire…. Follow us on Facebook. And I’m very happy to share that I have a new pair of Doc’s…. picked up at a decent price on eBay, lightly used. Love ’em! So, that’s it for now. Wishing you as much love as you can handle for Feb 14th! Wishing you all the very best!!!! And so we wind down to Christmas and the final days of 2016. All the presents are bought and wrapped, the festive food and drink is in… time now to have some fun, feasting and family time. I finished the year with a most wonderful job, a new drama series for BBC, written by Jimmy McGovern and starring Sean Bean. I play one of his brothers, along with amazing actors Steve Garti and Paul Copley. So, that’s something to look forward to in 2017! Also expect new songs and live gigs by The Yorkshire Teabaggers! And check out the digital download of our EP! Right, that’s it, let the festivities begin! Have a wonderful Christmas, and I wish you the very best for 2017! Be kind to each other – and to yourself. Why don’t you give your love for Christmas?